Ant-Man and The Wasp is sincere, heartfelt, funny, and thoroughly entertaining. The first Ant-Man was a mostly dull, forgettable, run-of-the-mill Marvel movie. You’d be forgiven to expect the same coming into its sequel, Ant-Man and The Wasp, which is also directed by Peyton Reed. But you’d be surprised. 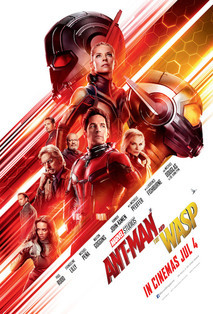 Because it turns out that Ant-Man and The Wasp is sincere, heartfelt, funny, and thoroughly entertaining. Set about two years after Captain America: Civil War, in which Scott Lang (Paul Rudd) as the new Ant Man joined Captain America’s team to fight against Iron Man’s, Lang has been under house arrest thence and is a short three days away from freedom. Life is pretty normal otherwise. He has a young daughter to care for and has to co-run a failing security business named X-CON with several ex-convict friends, Luis (Michael Peña), Dave (Tip “T.I.” Harris) and Kurt (David Dastmalchian); who enlivens the movie with hilarious scene-stealing comedy. Lang is determined to be a good father and make things right. But when Lang has a dream in which he senses the presence of Janet van Dyne, Hank Pym’s wife, whom we learn is trapped in the Quantum Void, that simple aspiration of domestic bliss is put into jeopardy. Lang, who had a fallout with Pym from the events of the first Ant-Man, hesitantly contacts him to inform him of his dream, and in no time, Lang is rendered unconscious and when he wakes up, he is riding shotgun in a car with Pym’s daughter, Hope van Dyne (a luminous Evangeline Lilly). Hope and her father are building a quantum tunnel in their lab in an attempt to travel into the Quantum Void to rescue Janet van Dyne. But first, they have to locate Janet, who is lost somewhere in the vastness of the Quantum Void. Somewhere in Lang’s head is the information of Janet’s coordinates. Continuing in the recent Marvel tradition of bad guys who don’t really want to be bad guys or have a good reason to do so, the main antagonist is Ava (Hannah John-Kamen), a trained assassin whose molecular constitution is constantly disintegrating and reintegrating, giving her the ability to turn invisible and phase through hard objects. Unwittingly acquired when she was young because of a lab accident, it’s an ability as well as a torturous affliction which Ava intends to cure with Hank Pym’s quantum technology, which she desperately and menacingly attempts to steal. The strength about Ant-Man and The Wasp is, perhaps ironically, its small stakes; its small but dear stakes. It does not have the apocalyptic world-about-to-be-destroyed stakes of the major Marvel properties (namely, the Avengers series), which has to keep escalating and escalating from movie to movie that it gets tiresome and potentially alienating. As audiences, we connect and relate more with Lang panicking to finish the mission so that he can return home before the cops discover his absence, thereby extending his house arrest than in Ultron unleashing another million of his robot drones against the Avengers whom we all know will survive and come out victorious anyway. What Ant-Man and The Wasp demonstrates is that sometimes, it’s better to go small than to go big.